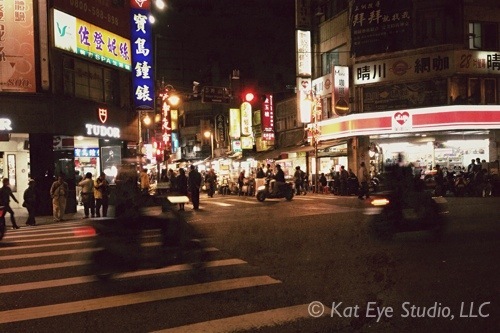 I’m in love with Taiwan! 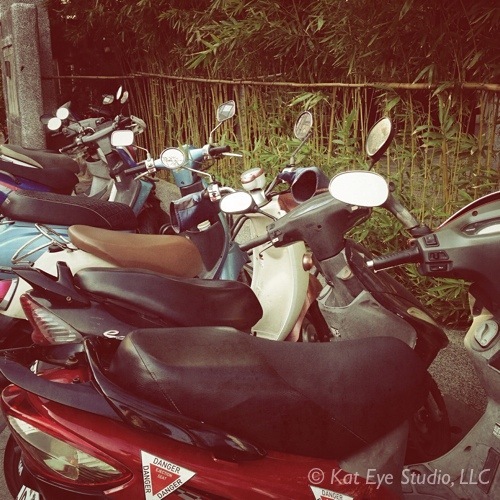 There are scooters everywhere. It’s reminiscent of Italy, only different in the sheer numbers and the type of scooters. 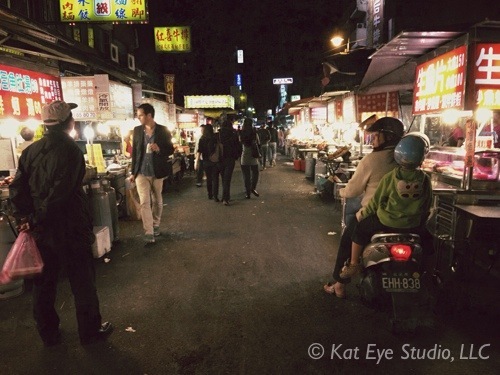 Taiwan is its own brand of scooter heaven. Oh, scooters, how I’ve missed you! Who needs trees when there are scooters about? Oh, how heavenly it was, to be back in the land of scooters! I didn’t spot any scooters in my excursions around Yorkshire, but London had a nice selection of scooters to photograph. 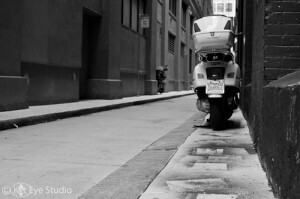 I’ve come to realize that my little scooter photography obsession is as much about place as it is about scooters. 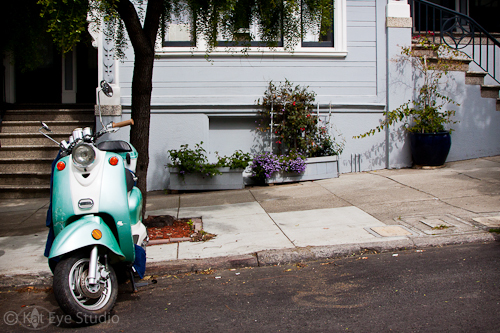 Usually when I’m capturing a scooter sighting, I try to find out if I can find an interesting composition that tells you about the place the scooter was parked, through the context I choose to include. 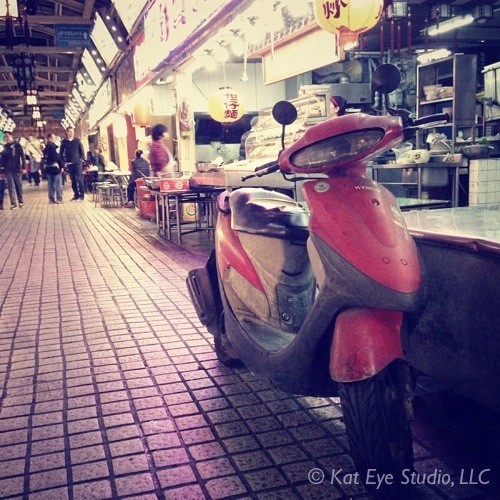 Interesting scooters and interesting places, a perfect combination! When I have a scooter sighting, it’s the perfect opportunity to use the Process of Elimination, which we’re studying this month in Exploring with a Camera. 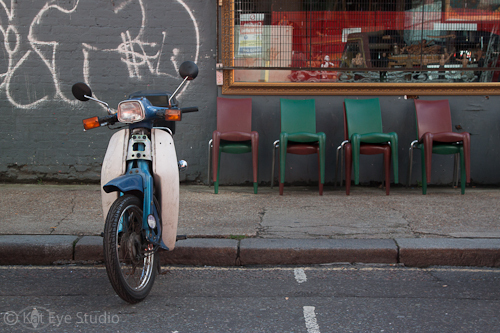 This wonderful scooter was spotted on the Hampstead workshop photowalk, just off Brick Lane. I thought it might be interesting to share my Process of Elimination for this image. All of the images shared are straight out of the camera except for the final edit. The first sighting was from walking down the sidewalk behind the scooter. 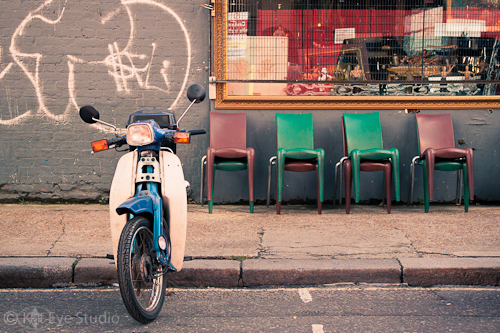 It’s an interesting scooter, not your usually cute one, but I thought the chairs would be great to include. It wasn’t a busy street (thankfully) so I stepped out across/into the street to explore the scene. The first shot I tried was vertical, going with the lines of the scooter. The vertical orientation doesn’t include enough of the chairs, which really add interest to the scene. The background becomes more of a distraction with this framing, with bits and pieces of too many things. So, the next step was to try horizontal. Better! 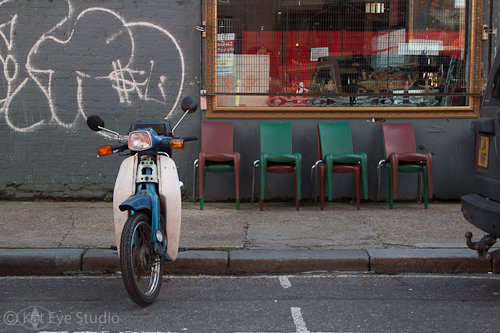 Got the chairs, the interesting window with the reflections, the graffiti. But the scooter is too high in the frame. The foreground of the road is doing nothing for this image. I want more of the interesting background. As I framed up the next image, this guy walked buy. Quick, catch him in a good spot! OK, I like where he is in the frame but this image is not really what I was looking for in the scooter sighting. He’s a distraction. So I capture essentially the same frame without the guy. You will note that I included the car on the right in the frame. That was intentional. I had the framing mostly the way I wanted it, but including a little extra would give me the most to work with later for cropping since I didn’t have time to work the scene further. I needed to move on, as the rest of the participants in the class had moved way up the street and I was lucky I hadn’t been run over by a car by this time. Have you been thinking about the Process of Elimination this last week? How has the idea of eliminating what is not essential to your message affected your capture or edit of images? Please share with us! You can link your exploration into the comments on the original post here. There are a couple of folks already linked in, so be sure to visit to see what they’ve found. And how do you like the process of linking into the comments? Would you rather have a linky? Let me know! I’m on the fence myself. I kind of miss the linky. PS – I’m off to the Vancouver Gathering with David duChemin this weekend. Yay! I’ll be away from the blog for a few days, but I’ll tell you all about it next week! Would you help me win a Vespa? My moment has arrived! 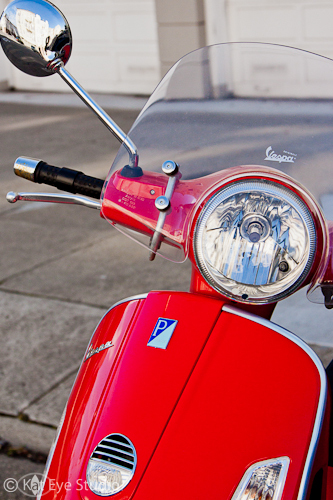 Vespa USA is running a contest to win, what else, a Vespa. I’m sure it can be red. And not just any contest, but a photo contest, called “Where would you Vespa?” And not just any kind of photo contest, but the kind you have to get out the vote for. Scooter Sighters around the world unite! 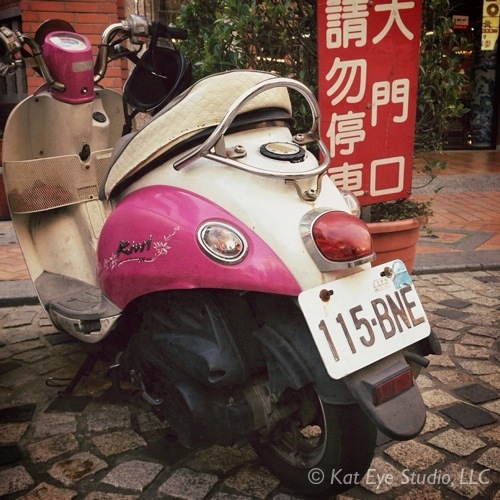 Help Kat get the red Vespa of her dreams!! Time for an Exploring with a Camera check-in! As I’ve taken a look at my images with Linear Perspective in mind, I’ve been noticing a common way I’ll use it in my compositions. I’ll put my subject on the left or the right of the frame, and then use the street, walkway or canal to lead the eye further into the frame. Not only does it give a sense of depth to the image, but a sense of place. This images are not only of the subject, but the subject in context. 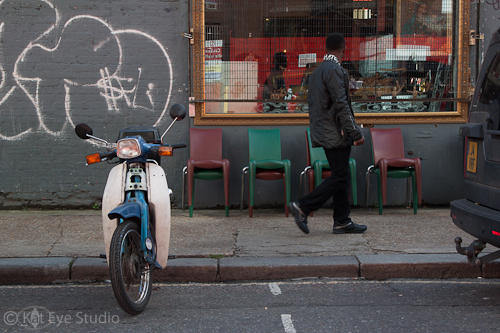 I’ll share a few examples I’ve noticed as I peruse my images. 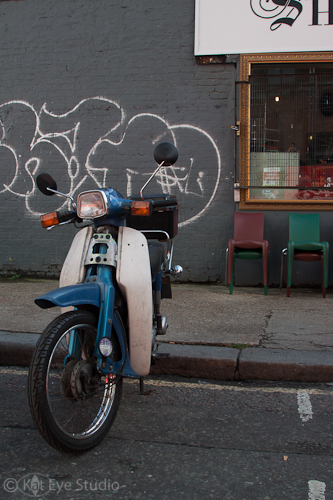 These vintage Honda scooters are not the cutest around. 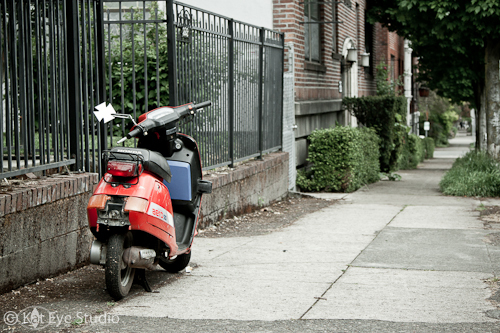 I’ll take a Vespa or Piaggio any day! But this one, with its cool rear view mirror, caught my eye in Northwest Portland. Getting lower and framing so that the sidewalk heads into the distance gives you a better feel. This is definitely in the US! I never saw sidewalks like this in Europe. So there’s a bit of a juxtaposition… A scooter parked on the sidewalk, but it’s in the US. Not so common! 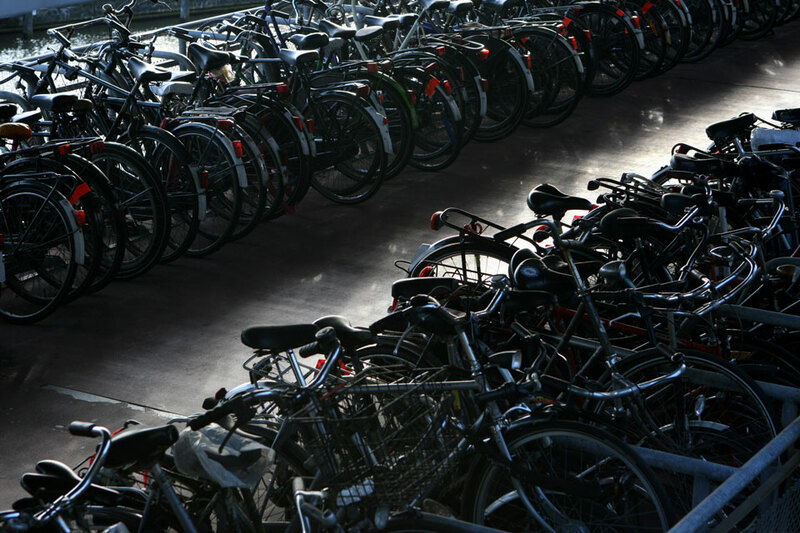 From Water to Wheels, one of my Market/Wheels images, utilizes linear perspective in its composition. 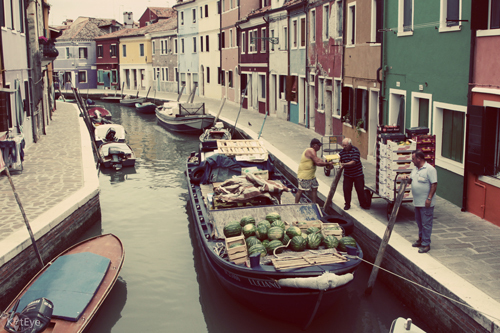 The men and the boat are the subject, but you are led deeper into the image by the receding canal and buildings. You might even wonder what’s around the corner. The lines don’t have to be absolutely straight to serve as linear perspective. In fact, it probably adds more interest to this image that they are not. Last, I’ll share my recent favorite from Korkula, Croatia. 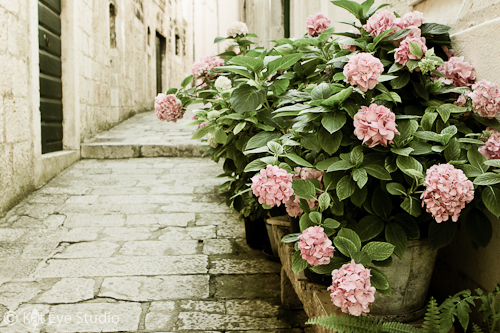 The potted flowers on the side of the narrow walkway are the big subject, taking almost half of the frame. But adding the linear perspective allows me to provide context. 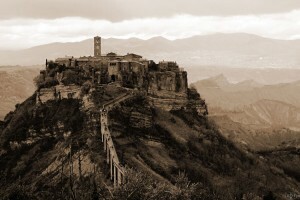 You see the stone of the walkway, leading you further into the town. Don’t you want to walk there? 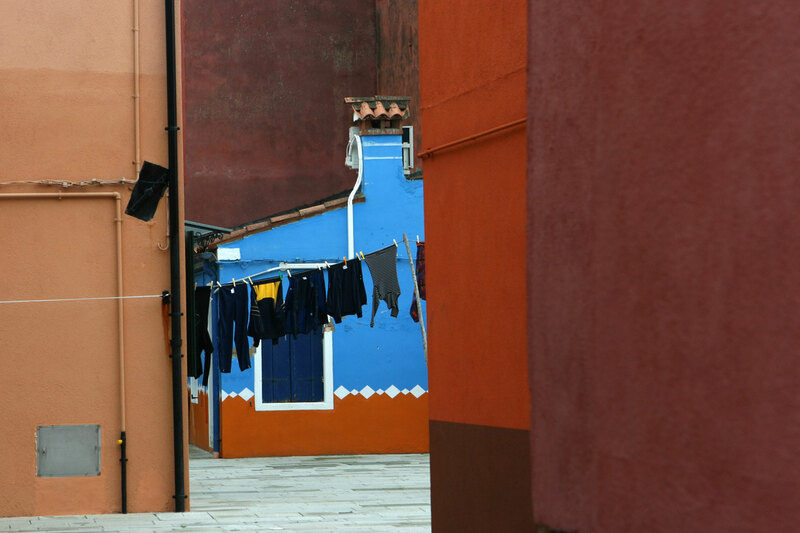 What have you discovered as you look at your images for Linear Perspective? Please Share! And be sure to visit the links of the participants. You will find some great examples! Meet Toan Lam. Founder of Go Inspire Go and writer for the Huffington Post and Intent.com, Toan and I first met in an online interview for Tea with Toan several months ago. We felt an instant connection as we chatted, discovering we have very similar philosophies. We both believe individuals have the power to make the world a better place; you only have to recognize your power and tap into it. Find your passion and act on it. When we discovered I was heading to San Francisco, his town, we made plans to meet up in person. Toan and I, along with his friend Erin, spent a morning together during my visit. We wandered the streets and they showed me their city. 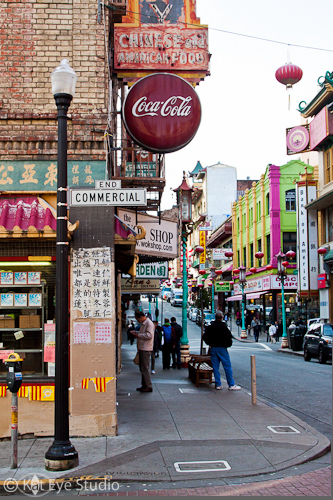 They took me on my first visit to Chinatown, where Toan introduced me to Boba Tea. 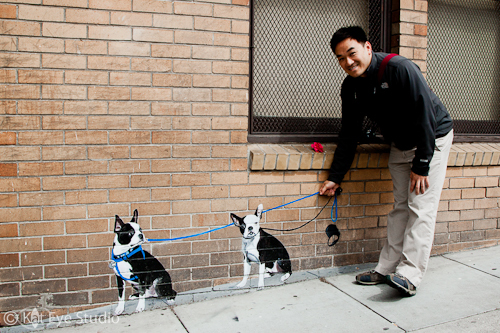 We hunted for interesting street art, and Erin led us to a famous piece by Banksy. 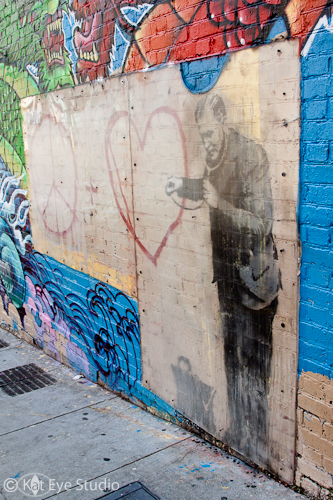 Up close and personal with Banksy street art, protected by plexiglass. 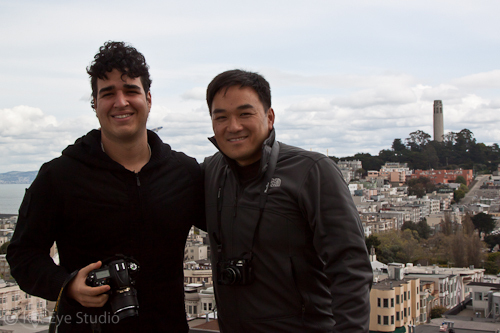 We checked out the view from Toan’s apartment, seeing his incredible view. We climbed the hill to the Coit Tower, sharing a peaceful moment looking out over the Bay Bridge. They experienced my obsession with scooter sightings, as I stopped to photograph every scooter along the way. Running through our fun trek around the city was a serious conversation on inspiration, life, and doing what we love to do. For Toan, that love is sharing people’s stories and helping others to use their powers – resources, talents, network – to help others. Toan’s background is TV journalism and through Go Inspire Go he provides a multimedia platform to tell the stories of “regular people” who are making a difference in small or big ways. 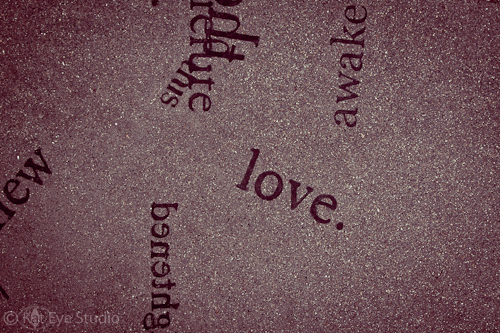 For me, that love is helping others find a connection to heart and soul through photography. We both feel immense gratitude for having discovered something that we feel called to do. Our lives are better for it. 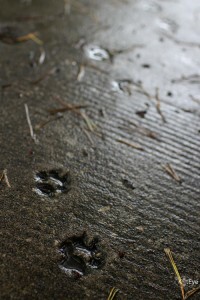 But we also talked about the difficulty that comes along with following a path that is not mainstream. When you are building something completely new, there is no map. 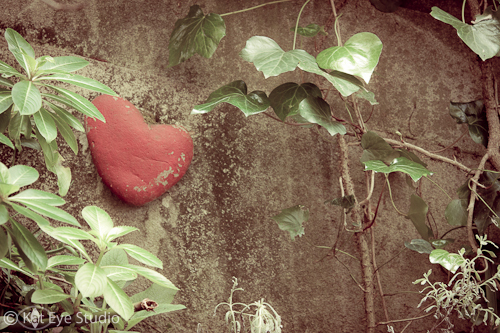 You can only follow your heart. Sometimes there can be a struggle with the idea of making a business out of a passion, because when you love and believe in something so much, you want everyone to have a piece of it. It is so valuable, you want to give it all away. This is the opposite of the business world, which is all about selling, monetizing and commercializing. End Commercial? I see a mixed message. We talked of how to find a balance between the two, and the examples we see around us of people doing it every day. The key is simple: Know your heart, follow your heart and trust that it will carry you in the right direction. Putting that key to use is not always simple, but it’s easier when you have the inspiration of people like Toan to help you along the way. My morning with Toan reminded me of my own passion, my own power. His energy, enthusiasm and belief in the connection with the heart to inspire change is contagious. I came away reconnected and inspired to do what I am here to do. Our morning together was wonderful. We walked. We talked. We photographed. 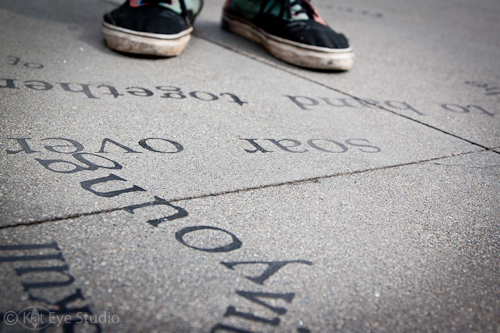 And found a true photo-heart connection in the streets of San Francisco. Learn more of Toan’s story and see his post inspired by our morning together on the Go Inspire Go blog today. It’s time to go exploring! In this month’s episode of Exploring with a Camera, we’re going to look at the use of diagonal lines in our photographs. I’m calling it “Dynamic Diagonals” because diagonal lines add a dynamic element of perceived energy and motion to our photographs. I started thinking more about diagonals after my portfolio class in March. The instructor commented on the effective use of diagonals in some of my photographs, like the one above from Amsterdam. I tend to incorporate diagonals naturally, so I thought it would be a good exercise do some research on the topic and explore how I use diagonal lines. Of course, I’ll bring you along for the ride too! The diagonal that provides the greatest sense of motion and speed is a diagonal from top left to bottom right. In his book Photographically Speaking , David du Chemin calls this the “primary diagonal.” We tend to read this as “downhill” and the eye easily moves through the frame. If you place a moving subject in the top left, it will be perceived as moving quickly. If you place a subject in the bottom right, the eye will be drawn to it naturally along the diagonal. The only other option for direction in a diagonal is the opposite, from bottom left to top right. 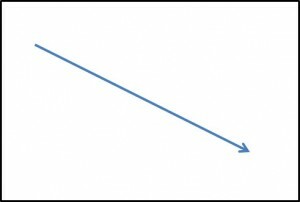 This “secondary” diagonal is not as easy or natural for our eye movement, and is perceived as “uphill” because of how we read. If you place a downward moving subject on the top of a diagonal in this direction, it will not have as great of perceived speed as along the primary diagonal. You can begin to see that the direction of the diagonal, primary or secondary, is an important choice point for our compositions. All other diagonals are variations on the primary and secondary diagonals; it’s just a matter of the angle. 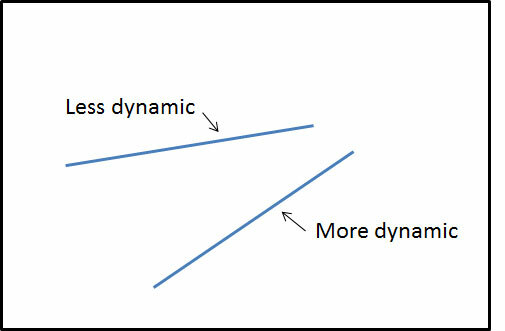 In The Photographer’s Eye , Michael Freeman discusses the effect of angle, stating, “Diagonals appear more dynamic when they form a stronger angle with the longer side of the frame.” This indentifies one more important choice points for our compositions: the angle of the diagonal relative to the frame. Regardless of what is going on inside the frame, the edge of the frame provides a straight and solid line. That’s the reference for all of our diagonals. All of this so far applies to one diagonal line, but there are often multiple diagonal lines in a photograph. 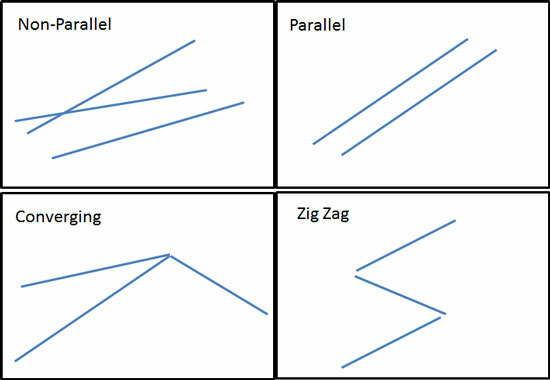 You can have parallel or non-parallel diagonals, along with converging and zig-zag lines. According to Michael Freeman, “A variety of diagonals gives the greatest energy to an image.” These diagrams will help you visualize the different configurations, and we’ll take a look at some examples below. Now that we know why and how diagonals work for us, we need to find them for our photographs. There are two types of diagonals: Natural and created. “Natural” diagonals are lines that are naturally diagonal relative to the other elements in our photographs and the frame edges. 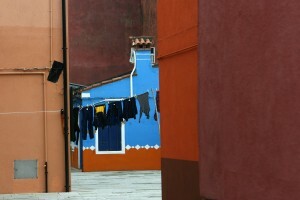 For example, the clothesline and rooflines in this image from Burano are natural diagonal lines. 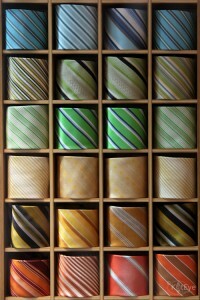 Along with color, the diagonal lines provide contrast that leads your eye directly to the subject. The slope of a hillside, or the branches of a tree are other types of natural diagonals. 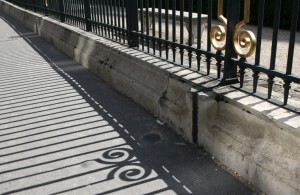 Shadows will often create nice diagonals too. 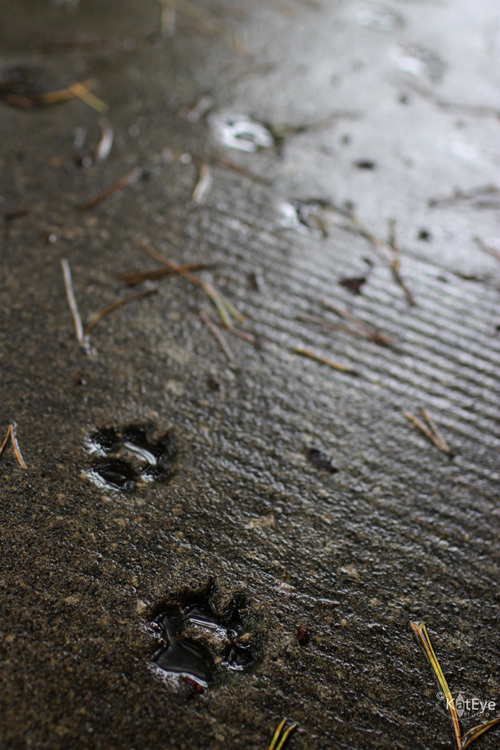 Keep your eye out for naturally occurring diagonal lines to incorporate in your photographs. 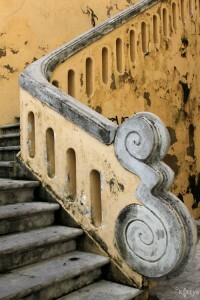 “Created” diagonals are those we create as the photographer, through our choice of perspective or composition. I’ve identified several different ways I create diagonals in my images: linear perspective, post-processed or composed tilt, point of view, and implied lines. You can also create diagonal lines by tilting your photograph. You can do this at the time of capture or in post-processing. 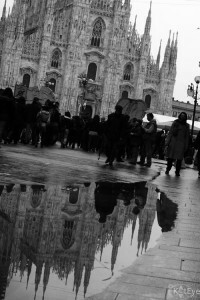 This image of the Milan Duomo in reflection was unique but lacked interest as I captured it in a standard vertical orientation. Tilting the image in post-processing made it more dynamic and interesting. I don’t tilt often — I tend to like my lines nice and straight — but this reminds me I should try it more! 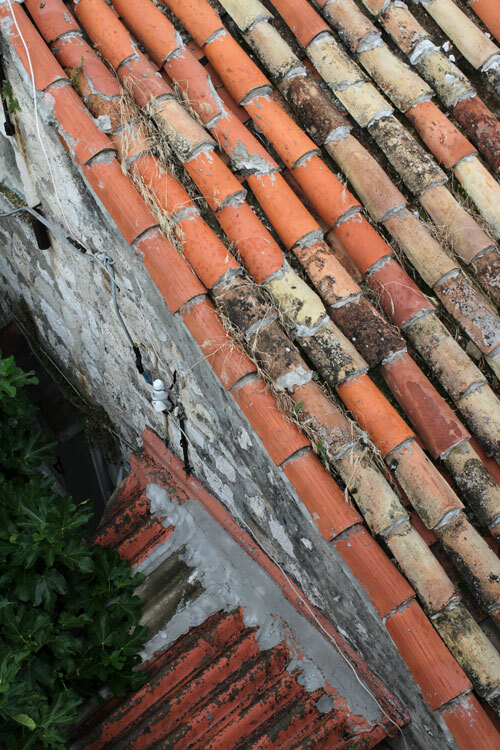 Tilting the camera at the time of capture, I created diagonal lines by running the roof tiles corner to corner. I like the contrast of the diagonal lines created by the smaller roof below. I somewhere heard a “rule” that you should not to run your diagonals into the corners, like I did in the image above. I don’t agree with this as a blanket statement, since I often like to run at least one diagonal into a corner. Take note and play around with where the diagonals begin and end in your images. 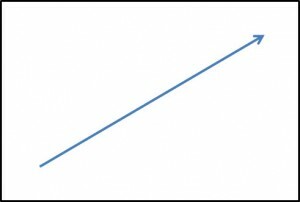 It’s another choice point for your composition, along with angle and direction of the diagonal line. As I looked at my images, I noticed that many of them have more than one diagonal element, often in opposition. 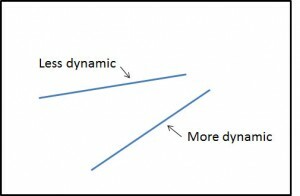 These images do seem more dynamic, supporting the premise above that images with a variety of diagonals will create more energy. One of my all-time favorite images, from Cascais, Portugal, uses a zig-zag to lead your eye through the frame. The diagonals were created by my point of view. I’m curious, does your eye move down the staircase or up? My eye moves down. 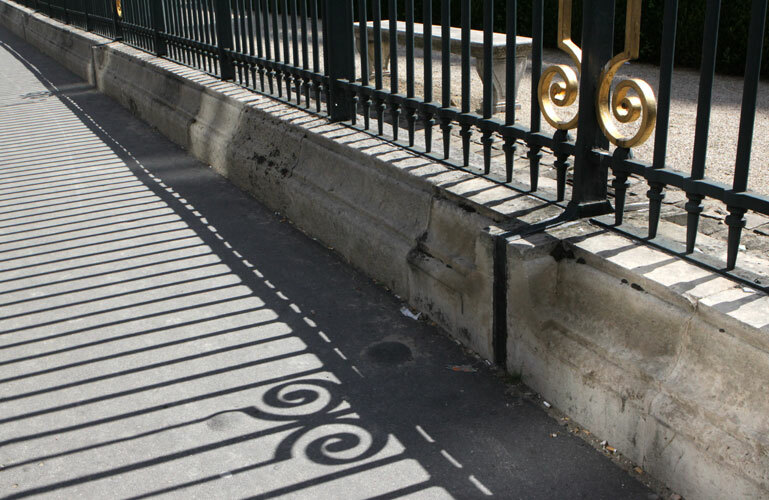 This image from Paris has a strong primary diagonal, leading you through the photograph to the spirals, my intended subject. The primary diagonal is created by my point of view, and enhanced by convergence due to linear perspective. Opposing diagonals come from the shadows of the bars lead you right back to the primary diagonal line. 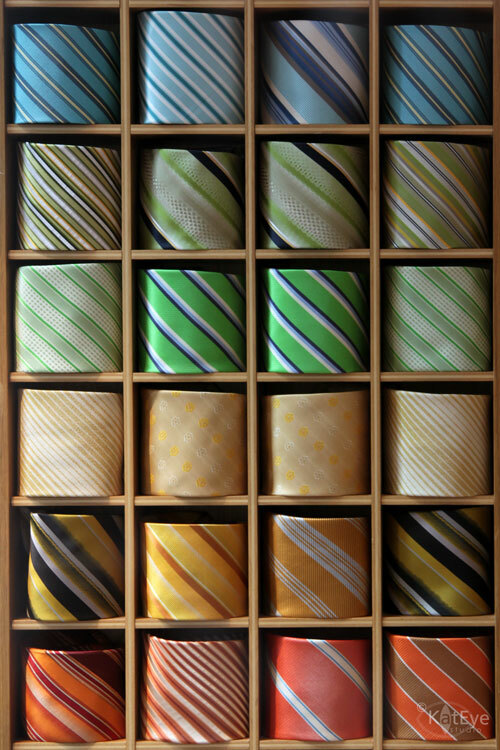 In a very simple composition, the diagonal lines created by the designs in the ties make this image dynamic. For me, the direction of the diagonal lines also contrasts with the direction my eye wants to move due to color, creating additional tension. OK, that’s enough of my images, now it’s time for yours! Take a look at your archive or go out shooting with diagonal lines in mind, and share what you find. 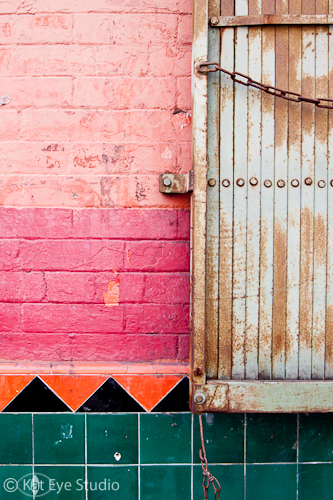 Diagonal lines create a sense of movement in your images, since your eye wants to follow the line. 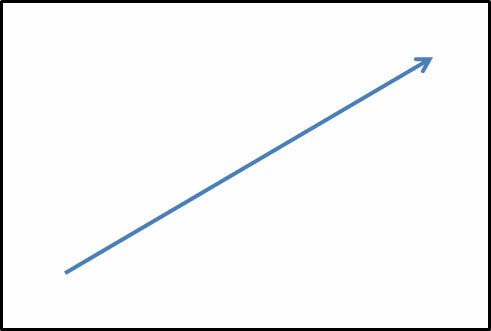 The angle and direction of the diagonal will affect the perceived energy of the line. Incorporating diagonals in a variety of directions will increase the energy in the image. 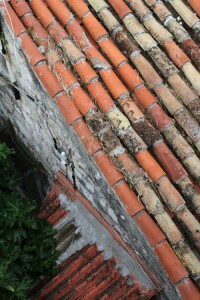 Diagonal lines can be found as both natural and created elements. Diagonal lines can be created in photographs through linear perspective, post-processed or composed tilt, point of view, and implied lines. You can link your exploration in below. See you soon!